Washing your windows takes you a great deal time and efforts? You can change this now – simply contact our customer care operatives and order our window cleaning in Bromley by Bow. We will manage this chore for you and the results will be perfect for all parts of your windows – the glass, framework and sills. With our support, you will have the freedom to do anything you want with the time you usually spend for window washing. But our services will give you even more, as you can witness from our list of advantages. We also provide our professional services in nearby areas: Devons Road, Bow Church, Old Ford, Bow Road, Ham. You can depend on the cleaners for both domestic and commercial window cleaning. Every kind of glass surfaces are included in our professional procedures. For instance, you can book a service for cleaning small or double windows, sash ones, French doors, bay windows and patio doors. In addition to these, we wash and polish garden window surfaces, conservatories and roof glass. At home or at your workplace, you can always have crystal clear glass – just phone us! We have what it takes and the right methods for the job. You can enjoy perfectly looking workplace with the help of the experts of commercial window cleaning. You can rely on our first-class services for every kind of business premises. 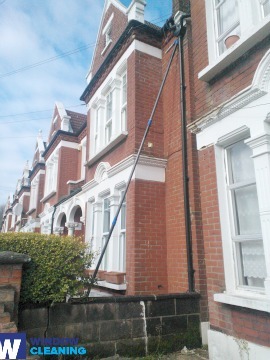 For example, if you own a small shop, we can completely wash its windows by using our water fed extension pole equipment – it allows us to go as high as the fourth floor. If you search for flawless look for the glass panes of a tall business property in London and the nearby areas, we will put in use our rope access equipment. In any case, you will enjoy superb results right away. We are happy to use the latest techniques to ensure that you get the best window cleaning. The glass surfaces of your property will be spotless after we utilise water-fed extension pole system and jet washing on them. We use our vehicles to supply the poles with water and we can reach up to the fourth floor. In case you need washing of highly-placed windows, we have rope access cleaners on hand. Call us on 020 3746 3113 and get in touch with us – these efficient methods will bring you results right away. You will have sparkly clean home after the professional window cleaners in Bromley by Bow deal with this task. We deliver great services for the entire London area. The leading techniques are included in our working routine – including water-fed extension pole system and and jet washing. You will see for sure the change domestic hygiene – we use purified water for the process of in and outside window cleaning. Contact us now on 020 3746 3113. Our customer service agents will guide you and answer all of your inquiries. In addition, you can use our online booking from.